Ladies, what are the qualities you look for in a man? My dream guy would bathe regularly. He would be able to move air in and out of his lungs with ease. He would also be literate. I do have a type—competent, adult men are the only thing that I like. 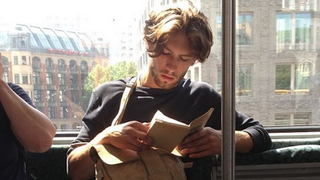 A new Instagram account called "Hot Dudes Reading" showcases creepshots of men on public transportation exercising basic literacy. You, the lady, are now welcome to be completely blown away by this truly spectacular feat. If your memory serves you well, you'll know that we've seen something like this before, with 2010's "Hot Guys Reading Books" Tumblr. Let me just be the one to say it: I AM NOT IMPRESSED. My first point of contention is that a bunch of these dudes are reading magazines. The account doesn't specify that the guys must be reading books, but that's sort of what you're expecting, right? It's one thing to subscribe to The New Yorker and keep the last five copies on your coffee table, but taking it out in public with all that wide paper getting in everyone's way at 8:30 in the morning? That's what Instapaper is for. I'm just saying, I think I'll keep my clothes on. "Hot Dudes Reading" pulls you in with one simple promise, but you should really stay for the captions. I read 100 Years of Solitude when I was 16. Hope that's a re-read, buddy. The account makes the bold declaration that they accept #NoKindles. Hmm, so they'll take magazines but not a convenient portable device that can store three thousand books? Exactly what game are we playing here? Not to be nitpicky, but I do have to wonder how we would respond to a "Hot Ladies Reading" account. It would be all too easy to surmise that we should be dazzled by women who are both hot and like to read. You know, like unicorns. And although I'm happy that these men can read, I think it begs the question: Do we even want men reading books? Books give you ideas and I'm just not sure that dudes can handle it. Someone please make sure to add: "Men Who Read Books: Are We Down With That?" to the agenda of the Brilliant Killjoy Feminists meeting. Image via Hot Dudes Reading.